winning team will choose the referee for the Psycho/Pagano match at TripleMania. Air Date: 08/27 & 09/03 – one show airs the night before TripleMania, one the week after. So, Tirantes will be refereeing the apuesta match at TripleMania, until he gets taken out and Piero runs down to make the count, or Tirantes will decided to count three for Psycho even though it makes no sense. Whatever happens, AAA’s always established the referee is the important part and this just continues that. 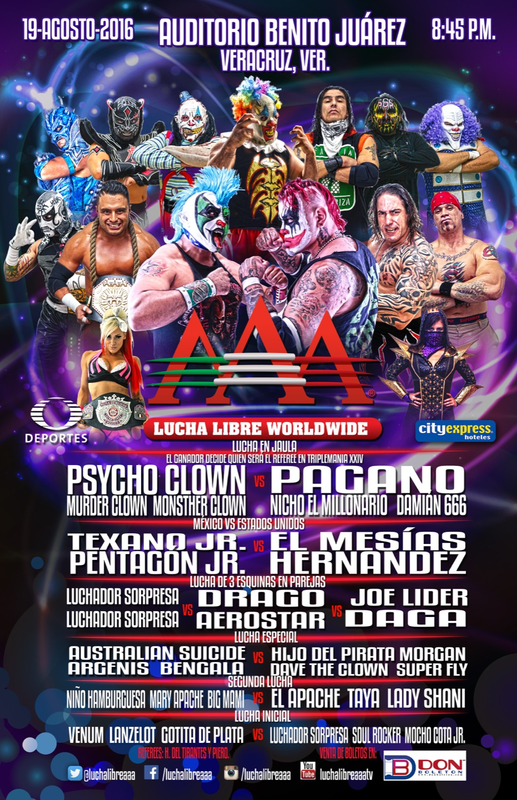 If anything, this lineup makes me think Psycho Clown might actually stand a chance of winning in Toluca, just so he gets one win to go along with his million losses. He’s not getting that win here. It’s actually a clever stipulation, because they can announce the card before this taping without giving away the result to this match. Semimain is Pentagon & Texano facing the two Trump guys they won’t face at TripleMania. Mesias not having a sure spot for TripleMania is very odd; maybe he does get added to the heavyweight title match to make it a four way. Dave the Clown gets moved up to the tercera because he’s kind of tall. Be tall, everyone. AAA’s spent all year running in place with Venum and Gran Apache and can’t be bothered to book them in the same match even when they’re on the same show. (Venum is not tall. Neither is Mocho Cota Jr. or Soul Rocker, who would be so much more useful and definitely more deserving to be in the tercera than Dave the Clown.) So they’ll just cost each other their matches, and continue running in place. One of these weeks is going to be a lame duck show, airing the week after TripleMania but having taken place before it, and those would be the weeks perfect for matches which couldn’t ever make a big show. That’s never how it works in AAA though, and the Venum/Apache feud will go onto until they someone gets hurt and they just forget about it. The mystery spot looks like a spot for a mini rudo; it’s odd it’s not one of the Mini Vipers, and makes feel like there’s a Facebook post I missed. I would not have high hopes for whoever’s in that spot. Next taping is TripleMania. It looks like that’ll air in order, so the next normal taping might not be as long as until the 09/17 weekend.